'Spring Fling' for added volume and a floral fragrance. No water, no fuss, this dry shampoo does a smooth job of absorbing excess grease & grime. It revamps the hair in seconds giving it added volume and a wonderful scent. It?s a bright and floral fragrance and with just one spray, you will surely feel your sweaty hair turn into bouncy, fresh smelling tresses. Just shake, spray and rub it on for 2 minutes to kiss the grease and grime goodbye. Explore the entire range of Shampoo available on Nykaa. 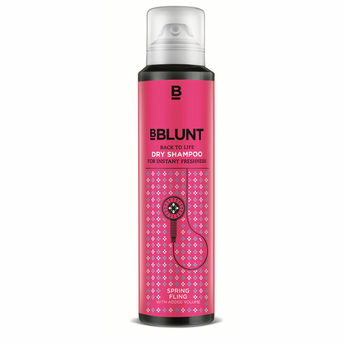 Shop more BBlunt products here.You can browse through the complete world of BBlunt Shampoo .